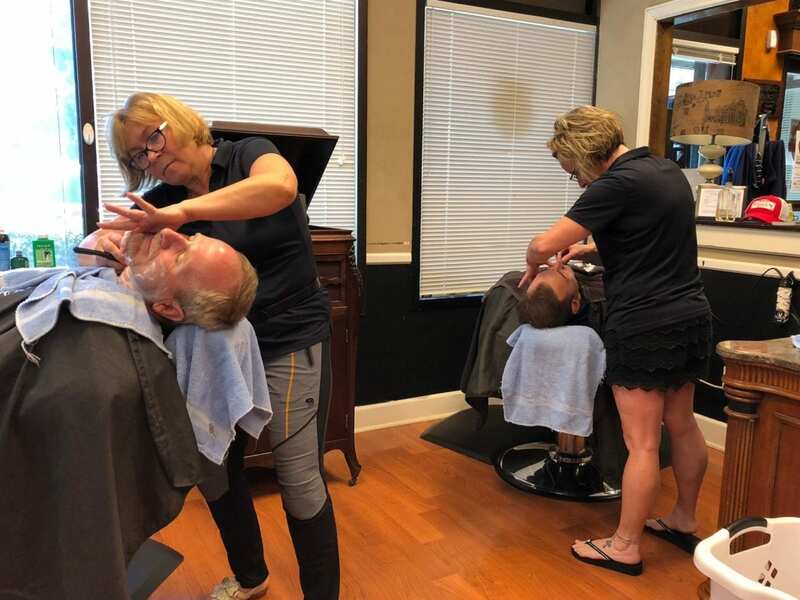 Bragg Media provides ongoing marketing and public relations support for Barbers of the Lowcountry, a long-standing and award-winning barbershop in Bluffton SC. 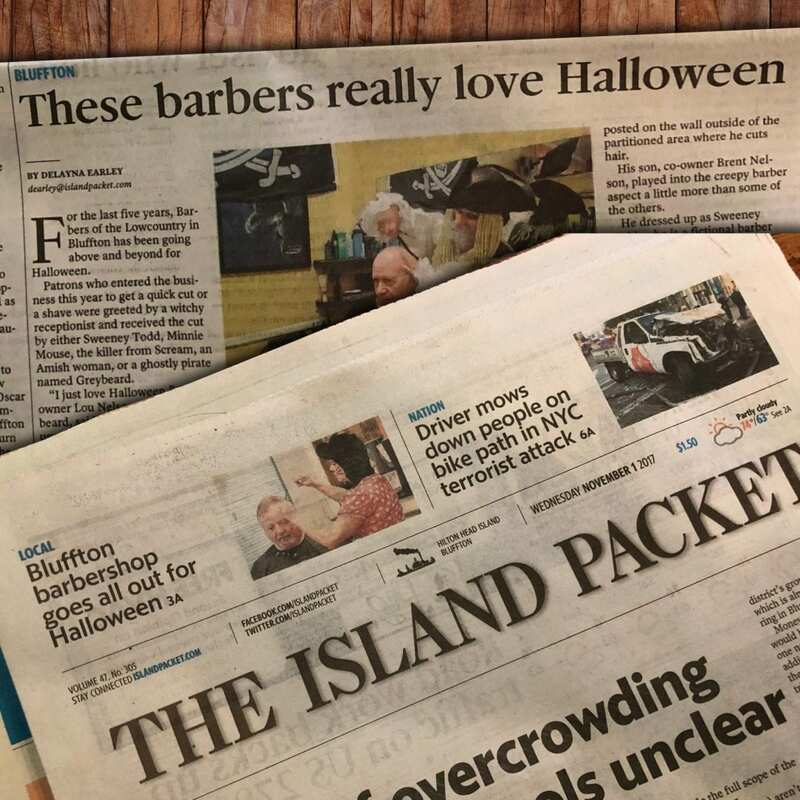 Within the first week of working with father-and-son co-owners Lou and Brent Nelsen, our team secured a centerpiece feature on the shop’s Halloween decorations and costumes in The Island Packet as well as an entertaining time lapse video shared to the newspaper’s website and social media. Since hiring Bragg Media, Brent has time to focus on growing his business, including the recent launch of a mobile barbershop. The ongoing publicity and communications plan has increased the shop’s customer base. As the owner of Barbers of the Lowcountry I am constantly coming up with great ideas to market my business. Since I am also a barber in the shop, one issue I always had was having the time to execute my ideas … When I decided to pull the trigger and hire Bragg Media, that was one of the best decisions I ever made. Not only are all my ideas being executed but they have a tremendous talent in design, and they come up with ideas I never thought about. It takes a tremendous amount of pressure off of me to know I have a great team managing all my marketing efforts. Barbers of the Lowcountry is a family-owned barbershop with a barber school in Bluffton SC. Brent and Lou Nelsen wanted to create a place “where real men belong,” a vintage vibe barbershop with creature comforts including luxury shaves, local beer on tap, high quality grooming products and barbers who put customer service first, always. Part of their mission is to create a place in the community where families can go to make memories. Brent Nelsen hired Bragg Media marketing agency to manage all of the marketing efforts. Since our team has taken over, we regularly publicize special events — including their Clipper Cup Golf Tournament that raised money for Bluffton Self Help and their 20th Anniversary party — and spread brand awareness through organic marketing such as Facebook, Instagram and email marketing. Barbers of the Lowcountry started in 1997 and has been growing ever since. Brent has always been a marketing maverick, coming up with ways to promote the barbershop and create excitement with his current customers while attracting new customers at the same time. He couldn’t manage marketing, perform the day-to-day operations, continue teaching and training barber students and cut hair. Hiring Bragg Media freed up Brent’s time to do what he does best — run his business. When we first started working with Barbers of the Lowcountry, we spruced up the barbershop’s Facebook page, created an Instagram page and began migrating their website to a secure hosting environment for a better user experience. It’s easy to market a business with owners who are active (and have fun with) their marketing. Their customer and fan base are very active on Barbers of the Lowcountry’s Facebook and Instagram — where we promote their events, their products, their services, their people, their story. With any B2C business, it’s easy to take the salesman’s approach of pushing products and services. However, Bragg Media strives to tap into the emotions surrounding Barbers of the Lowcountry of family, community, fun, honesty and integrity. The barbershop crew is a tight-knit group that takes pride in their work and genuinely enjoy their customers. It’s our job to showcase that atmosphere in all aspects of their marketing.